The year was 2005, you were young, carefree and prone to make a few bad decisions in your life. It was also the year that you and your boyfriend, Paul, swore an oath of love and were destined to be together forever. In celebration of your undying love, you had “Paul” tattooed on your wrist, complete with two little hearts forever chained together. Now you are engaged to John and that tattoo on your wrist will probably spoil some wedding pictures. In addition, John really isn’t too keen about that tattoo on your wrist. Perhaps you should seriously consider having it removed. A lot of people think that getting a tattoo is a neato idea at the time, but at some point, many regert, er, regret the decision. Northern Colorado Laser and Skin is a Greeley medical spa that offers all sorts of services including Coolsculpting, laser hair removal and eyebrow etching. And for those who have bad ink, we offer laser tattoo removal. 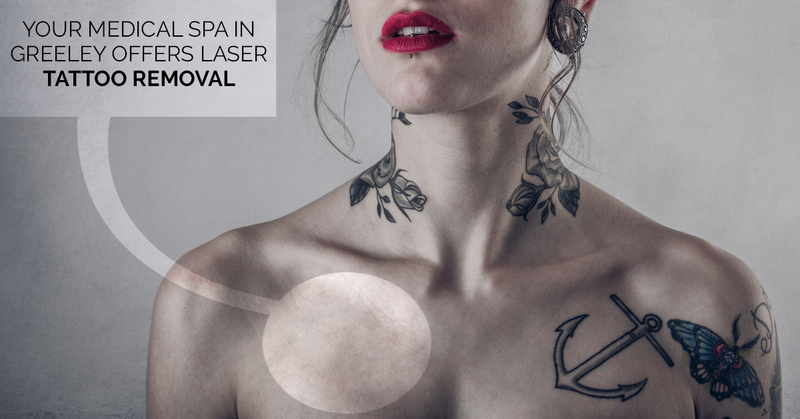 There are several reasons to consider laser tattoo removal, here are just a few. For some, the outcome of the tattoo wasn’t exactly what they imagined. Perhaps it just doesn’t look like what it is supposed to and you are getting negative feedback from family and friends. Maybe the tattoo you got looked way awesome at the time, but now it’s dated and pretty cheesy. For example, having a line of lyrics from that Bon Jovi song tattooed on your arm was way cool in 1985, but now it only gets laughs and predictable comments. You may have thought at the time that you were going to be with him or her forever, but life doesn’t always turn out the way you expect. And really, there is no need to go through life with the name of an ex on your body. There are plenty of activities you should avoid when you have had too much to drink including driving, texting and hooking up with someone at the bar. It is also wise if you abstain from getting a tattoo while under the influence of alcohol. What might be the greatest idea in the world is likely to become the biggest mistake of the evening. You are ready to have kids and raise them to be fine, outstanding citizens. You want to set a stellar example for your children, but that is rather tough to do when you have an obscene tattoo on your lower back. It is definitely something you wouldn’t want any kid to see. That arm sleeve or neck tattoo might have been all of the rage back in the day, when you were flipping burgers and grilling riblets at Applebee’s, but now that you trying to work your way up the corporate ladder, you think it might be slowing your roll. Unfortunately, you are probably right. There are still many people in the corporate world who frown upon those with visible tattoos. You might have a tattoo that is still cool and relevant and not in a location that is keeping you from getting a decent job, but it has faded over the years and just doesn’t look as good as it once did. It might be time to just have it removed and move on with your life. While we applaud individuals who are true to themselves, if you have a tattoo that your spouse doesn’t like, you should really seriously consider having it removed. The last thing you want in a marriage is friction that can be resolved by laser tattoo removal. Just as there are really incredible tattoos out there, there are just as many that are really bad. These tend to be the tattoos that were cheap, the ones that were performed at your friend’s apartment and the ones done by artists who don’t know how to spell. Bad tattoos need to go, no excuses. So if you have a tattoo that needs to go, contact Northern Colorado Laser and Skin and ask about our laser tattoo removal services. And not to worry, we won’t judge.